Make this Pie de Limón recipe featured in the POV film, Tea Time. Mix flour, powder sugar and margarine in bowl, and mix with fingers until is crumbly. Add egg and knead until dough is firm and smooth. Stretch the dough to about 26 to 28 cm diameter and place in oiled and floured pie plate. Prick dough with fork and place pie plate in pre heated oven on 350°F for 10 to 12 minutes until lightly cooked. In a bowl, mix sweet condensed milk with lemon juice and mix well. Pour over pre-cooked dough and place in oven again, lower temperature and bake for 10 to 15 minutes until the filling becomes firm and the dough is fully cooked. Meanwhile, mix in bowl the egg whites with granulated sugar and cook in double boiler stirring from time to time until sugar is dissolved and thoroughly mixed. Remove from double boiler and beat for 8 to 10 minutes until the mix triplicates in size and becomes foamy and glossy in texture. 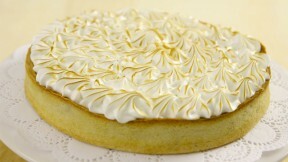 Remove pie from oven and cover with fresh meringue in a decorative way. Let it cool and serve.